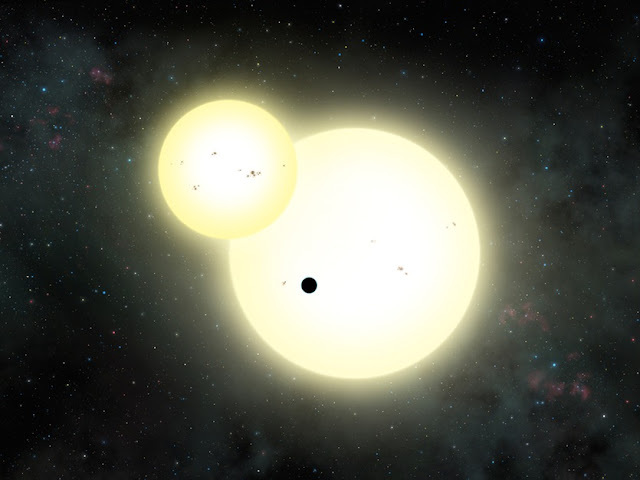 The discovery of a new planet that orbits two suns simultaneously was announced this week at a meeting of the American Astronomical Society in San Diego. With a mass and radius nearly identical to that of Jupiter, the planet, Kepler-1647b, pictured here as an artist’s impression, is the largest circumbinary planet -- a planet that orbits two stars -- ever discovered. Located in the direction of the constellation Cygnus, Kepler-1647b is 3,700 light-years away from Earth and approximately 4.4 billion years old, roughly Earth's age. The stars it orbits are similar in size to our Sun, and it also has the largest orbit of any circumbinary planet ever found, taking roughly three Earth-years to orbit its host stars. The team that discovered the new planet used data from the Kepler telescope and includes astronomers from NASA's Goddard Space Flight Center, San Francisco State University and San Diego State University.